Salutations, Freeland fanatics, and welcome back to another electrifying breakdown of Black Lightning! This week’s episode was quite the family affair, with a wide array of edge-of-your seat action that included (but was not limited to) clandestine secrets, government experiments, civil rights countermeasures, daddy-daughter time, and more. Now, as usual, I’ll try my best not to spill everything everywhere, but you have been warned... there are spoilers ahead. First, let me say, wow. Episode eight was just…wow! The action picked up right where our last episode of Black Lightning left off, with Jefferson deciding to train his newly-powered daughter, Anissa. They’re in the basement of Gambi’s shop going AT IT, mixing hand-to-hand combat with hologram recognition strategies. He’s teaching her new moves and she’s showing her stuff. The best part, was that it’s all happening inside of a montage of Freeland citizens complaining about Black Lightning’s lethal new methods (as last episode’s mob-style hit on Lady Eve made it look like Black Lightning was the one who did the deed). Next, we see Lala (now, somehow, not dead by strangulation) getting a ride home with his two new goons, the ones he met back at the hip hop club (I wonder what this means for backpack boy and tight jeans kid). They’re up front while Lala rides in back chatting it up with the ghost of Lawanda, only no one else in the car can see her but him, so it looks like he’s back there talking to himself, making the newly, back-from-the-dead-Lala seem crazier and more dangerous than ever. Jefferson takes Anissa out for her first mission: finding out who really killed Lady Eve to clear Black Lightning’s name. This leads Jefferson and Anissa to a shallow grave deep in the woods, in which lies the guy that actually killed Lady Eve and his fake black lightning murder weapon—some kind of super nuclear plasma rifle. 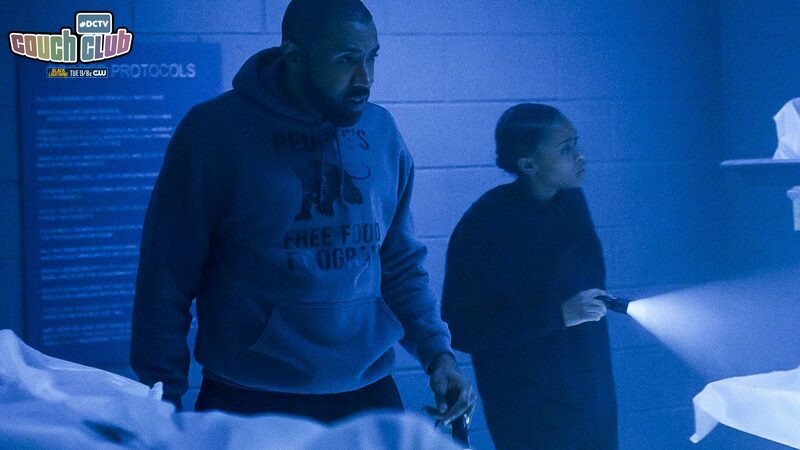 After their grisly discovery, Black Lightning introduces Anissa to the “BlackPhone” and reaches out to Inspector Henderson to report their findings. Unfortunately, Inspector Henderson doesn’t come to check out the lead himself and the person sent to check on the evidence didn’t know how to operate the plasma rifle causing it to detonate. Luckily, Anissa was there to leap into action and save her father from the incurring explosion right at the nick of time. Gambi gets a visit from an ASA rep. The rep tells him that the time has come for them to kill Black Lightning, and because he is interrupting the flow of Green Light, they can no longer afford to let him live. Later that night, Gambi gets a surprise visit from Lynn. She lets him know that she’s put the pieces together and Alvin Pierce’s DNA is linked to the production of Green Light. She tells Gambi that he MUST tell Jefferson now. The next day Gambi invites Jefferson down to the basement and reveals everything. His real name is Peter Esposito and he helped experiment on the community of Freeland. Gambi says as soon as he found out that ASA were killing children, he wanted out, but when he learned that Jefferson got abilities, he stayed in to protect him (after the ASA killed his father). He tells Jefferson that he can no longer stand in their way, and that if he (or Anissa) goes out in the suit or uses their powers, the ASA will find them... and kill them. What an ending!!! The only thing that can make that better is a “We are Family” (Dreamgirls or Sister Sledge version will do) playing in the background… Hopefully they find a way to work that into a future episode. The family motif was masterfully interwoven throughout the entire plot this week, starting with Lynn finding out how most of the meta shenanigans in Freeland stem from Alvin Pierce’s DNA (Jefferson’s grandfather). Jefferson’s adoptive father (Gambi) has been working for the government agency that’s responsible for the death of his father and brutal experimentation of his fellow Freelanders. Anissa (Jefferson’s oldest daughter) begins training with her father so she can be ready for action the next time they hit the streets. All that, and the episode wraps with Jennifer discovering that she has phone-destroying superpowers! Will Anissa spill the beans about the daddy-daughter training montages? Will Lynn? They were all comfortable keeping secrets from her when she was a normie like Lynn, but I wonder what’s going to happen now? That’s it for this week’s episode of Black Lightning! Like always, you can tell me how you felt about tonight’s episode in the comments below. And, remember, for more from me on all things Black Lightning, just follow me on Twitter at @RegularEtCetera. Peace!